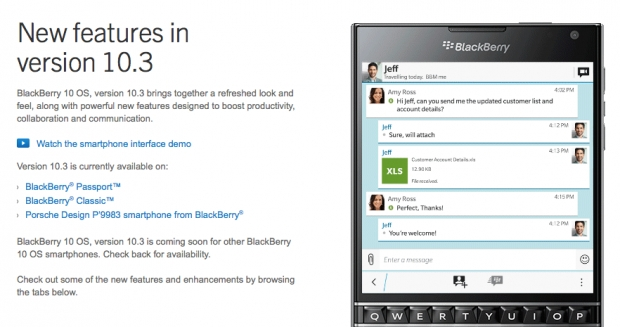 BlackBerry OS 10.3.1 Officially Released | BlackBerry Blast! BlackBerry has released a major update to its operating system today, taking it to OS 10.3.1. The update brings new features to older BlackBerry's who have not been updated in awhile. Newer BlackBerry's like the Passport and Classic have many of these features baked in. If you have a Q or Z series BlackBerry, you will want to check out the update. One of the major new features is BlackBerry Assistant, the Siri-like virtual assistant for BlackBerry. Now BB users can talk to their devices too! BlackBerry Blend is a feature that allows users to access the contents of their phones from a computer. Other features include improvements to BlackBerry Hub, better battery life (up to 15% more life), and access to the Amazon Appstore where BlackBerry users can get many Android apps. BlackBerry 10.3.1 is now rolling out in the U.S., Europe, Canada, the Middle East, Africa, Asia Pacific and Latin America.